Here is part 2, of my 3 part post on traveling with a child. You can see part 1, traveling with an infant, here. When Harlow was 11 months, we did a big international trip to Australia and New Zealand so that was a completely different experience and required a lot more planning than when I did a weekend getaway with her when she was 5 months. 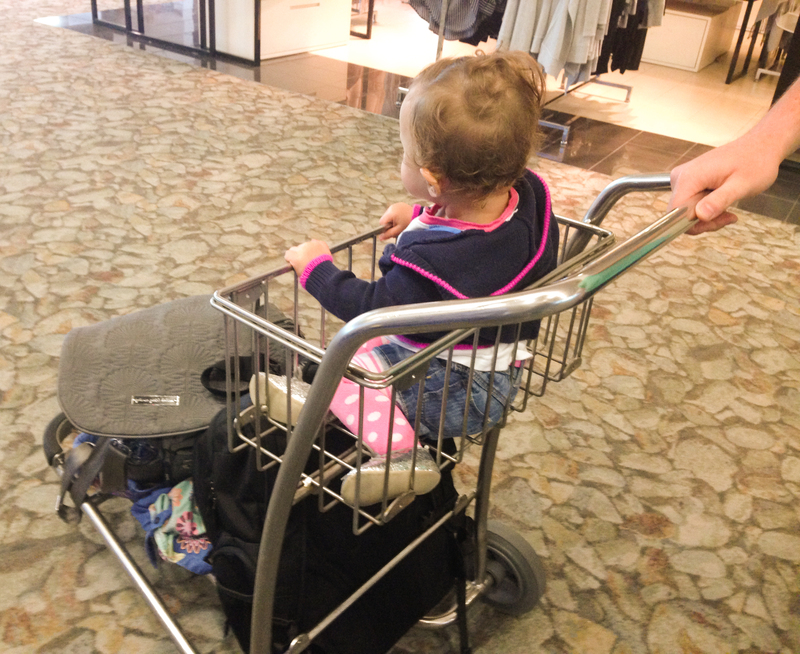 Harlow had just learned to walk, so it made getting through the airport and plane ride that much trickier. As stated in part 1, these tips are just for the journey so don’t forget to pack all the necessary clothes, food, medicine, etc that you might need for your actual final destination. I actually did bring enough diapers and formula (I had stopped breast feeding a few weeks prior) for the entire two weeks. The only reason I did this was because Harlow was on a very specific formula that our family could not find in New Zealand and Harlow gets rashes from literally every kind of diaper except Honest and 7th Generation. The nightmare of a constant diaper rash for two weeks kept playing in my head, and I didn’t want to deal with that. Your baby will need a passport, so allow plenty of time to get that organized. Both parents have to be present to do the passport paperwork (unless written notice is given), so that is an added step to organize. I also brought a copy of her birth certificate just in case anything happened. Get visas for everyone ahead of time for each country you are visiting. Request the seats with bassinets when you book your ticket. We were able to pay for ours (I think it was about $50) but other airlines are just first come first serve. If yours is first come first serve, definitely keep calling or emailing leading up to the flight to make sure you get one of those seats. Harlow just barely fit in it length wise, but I would still get it if your baby is under the weight limit to give her a place to hang out (if you haven’t paid for a seat for her). As with the short, domestic flight, run the trip past your pediatrician. I doubled checked with ours and made sure we didn’t need to get any vaccinations before we left that could leave her compromised if we didn’t get them. Again, get a written note, just to be safe. Also, check the rules on the country you are visiting to see if they have any specifications on what vaccinations your child might need before entering. If only one parent is traveling, get a written note from the other parent saying it is ok to take the baby out of the country. I would include a copy of their passport or drivers license just to be extra safe. You just never know! Under 2, they still fly free, but you absolutely cannot forget to add them to your reservation because you will have to pay taxes for their flight. We did not pay for her seat, since they were about $2,000 each, but if you have the spare money, then it would totally be worth it. My list is actually pretty similar to the list I posted in part 1, but since Harlow was eating solid food at this point, I added a few other things. Plum Organic pouches – It was way too difficult to pack homemade food, so I packed a ton of pouches for her. This also saved the hassle of feeding her with a spoon. Plum Puffs – These were SO entertaining for her and kept her going for some time. Bib – I like the silicone ones that can be rolled up and washed easily. Snacks, snacks and more snacks. Seriously. Little bite size snacks are going to be your life saver on a long flight. If you think you have enough, you don’t, so go pack 5 more! Jammies – We were on an over night flight, so we packed her jammies, sleep sack & favorite binkie for bed time. Ipad – Harlow has never been in to it, and still isn’t, but it kept her occupied for about an hour throughout the trip at various times. Sure that isn’t much time to keep a child entertained, but on a 12 hour flight and a few hours in the airport, that is better than nothing. If you have a slightly older child, I would look into some headphones for her to wear, especially if she likes lots of games or shows and you know she will be entertained by the iPad. Also, Harlow loved playing with our phone at this stage and looking at slide shows (of herself, naturally). She also liked hitting the home button a million times, so we gave that to her on the plane more than the iPad. Stickers, sticky notes to pull apart, magnetic blocks, soft book, tape, mirror, magnetic doodle, keys (and not the fake plastic keys, your kid is always going to want the real deal), and any little random stuff you can find from Target Dollar spot. Diapers – plan 1 diaper for every 2 hours and then a few extra after that! Ziplock bags or arm & hammer bags for dirty clothes or dirty diapers that need to be thrown away in the plane bathroom. Travel size dish soap to wash bottles & sippy cups. This will also come in handy when you find yourself needing to wash the bottles & cups in the hotel bathroom sink! We did pack a few books, but didn’t use them enough to make the extra weight worth it. I wouldn’t bring those next time. Some international airports have kids areas. Find one of those and let your baby run around to hopefully run some energy off. A few of our flights made us actually check in our car seat and stroller and gave us a loaner stroller, which was pretty nasty. So if you baby wear, this would be a good time to bust yours out and wear your baby or let her walk, if she is walking at this stage. At 11 months, Harlow hated baby wearing. I tried to put her in the Ergo a few times, and it was quite possibly the worst thing that had ever happened to her. Go in to all of the stores and hopefully distract her with that. We took her in to duty free and the bright lights and random crap entertained her for a bit. Eat something in the food court. I know some flights offer meals for the toddlers, but ours did not. Find an empty-ish terminal lounge and let her play on the chairs. Harlow was fascinated by the chairs that were all stuck together. Whatever works, right? Look out the windows at the planes. Toys to entertain her once you’ve exhausted all of your resources from the airport: Stacking blocks, Little people car, 3 oz bottle of bubbles (make sure you have it in a clear bag for security), various size & shaped balls. Note: these were all brand new toys we got for the trip. I was told to bring something she has never seen to keep her interest as long as possible. Or, just put away some go to favorites a few weeks prior to the trip so they will be like new when you bring them out. Change the diaper right before boarding. They let families with small children board first, so definitely take advantage of this. 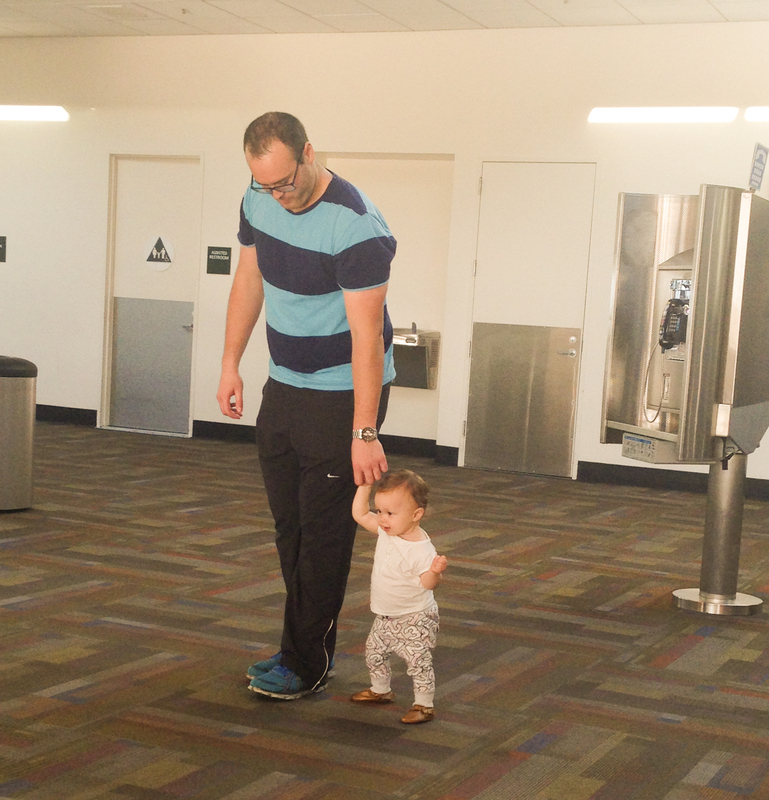 It takes a bit of time to get on the plane with you, the baby, the diaper bag, the carrier, the toys and to get situated. As you board, gate check your stroller and car seat. They will give you a tag to claim them when you get off. In most cases, you will pick it up right when you walk off the plane, where you dropped it off, not at baggage claim. Also, it is typically the last thing to come up from gate check, so don’t be in a huge rush to get off first…unless you have an upset baby, of course. 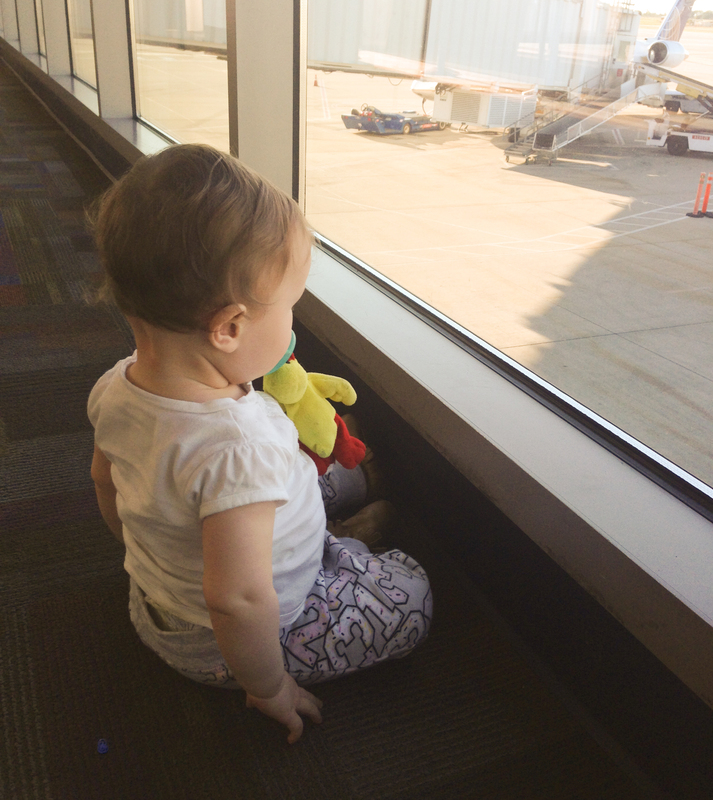 Our flight was an overnight flight, so change your babe in to her jammies before you board. I would recommend something warmer since planes are cold. After getting fully situated try to distract your baby with anything and everything you can think of before pulling out the toys and activities. Wave hi to everyone walking by. Point out things you see. Open the magazines and flip through the pages. Open up the sick bag and let her look in it. Crumple up bits of paper and put them in the bag or a cup and let her pull them out. Pull out the arm rest and let her push the buttons. I let her hit the remote buttons so we didn’t accidentally hit the call attendant button. Look out the window if you are by one. Talk about the planes driving by, the luggage being put on the plane & the men directing traffic. Do everything you can think of, and I mean everything, before you even contemplate bringing out toys. And then finally, bust out your airplane toys. When she is completely bored of those, you can bring out the airport toys (yes I had two different sets) and hopefully that reboots her interest. Harlow did sleep for a few hours on each long leg, so that really did help us quite a bit. As I said in part 1, if your toddler starts crying, stay as calm as you can as it will pass. Harlow cried for about an hour at take off on both of our long haul flights, and it was awful (in my mind). I felt so bad for everyone around me. But then I realized that the plane is so loud that people could probably barely hear her, and two, everyone had their headphones on.